Brothers Didier and Pascal quickly established themselves as rigorous growers after taking over this 32-acre domaine from their father in 1976. They prune severely in winter and de-bud twice in spring for low yields. They look for elegance, length, purity and minerality in their wines, while aiming for age-worthiness and moderate levels of alcohol. It’s kind of a nice throwback. The domaine and its vineyards are in the commune of Chichée, upstream from the town of Chablis and the grand crus in the Serein River Valley. The hills are steep here and are graced with two noble premier crus on either side of the river: Vosgros and Vaucoupin. 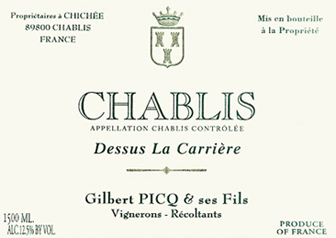 The latter is especially noteworthy, for Vaucoupin occupies the same contours as the grand crus on the right bank and is considered to be one of the best premier crus in Chablis.